Those of you who are following this blog closely may ask what happened to Thur?. Just not many photos taken, that's all! 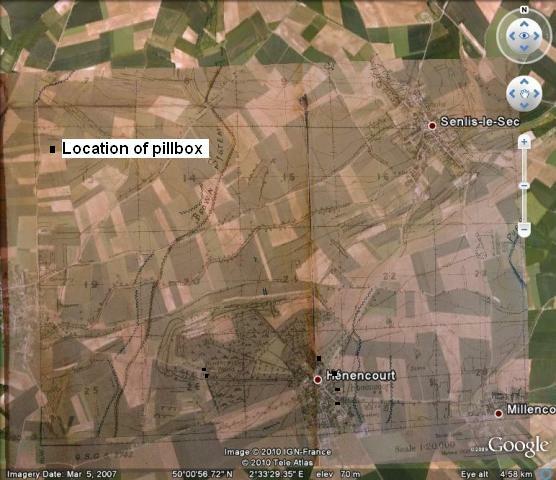 So to Fri - started the day with a visit to Henencourt for some pillbox spotting. At the height of the 1918 German spring offensives the British began construction of a number of defensive 'stop lines', principally to guard supply routes and the channel ports. Henencourt was on one such line and was fortified with at least eight pillboxes (although one not completed - per P Oldham, 'Pillboxes on the Western Front'). Quite why Henencourt was fortified I don't know (more research needed), but from a trench map in my brothers collection it was between the 'purple' and 'brown' system in the rear of Albert. 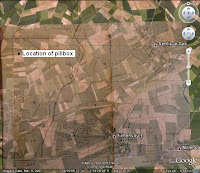 The first two images show firstly a the trench map around Henencourt (thanks to T Thurlow), with the second being the map overlain on Google Earth. Third and fourth image shows a twin Vickers machine gun pillbox built into the garden wall of Henencourt Chateaux while the fifth image shows the one-off Vickers mount (not quite sure how it would of worked!) used in this pillbox. Sixth image shows one of the embrasures of this pillbox in the Chateaux garden wall. Last image shows a triple embrasure pillbox. Rest of the six pillboxes we've seen tomorrow!